Though often overshadowed by many of his contemporaries, Edward Johnson was one of the reliable brigade and later division commanders that formed the backbone of the Confederacy’s officer corps. Born in April 1816 in Chesterfield County, Virginia, he spent most of his childhood and formative years in Kentucky prior to accepting an appointment to West Point in 1833. There, Johnson’s poor academic performance forced him to repeat his sophomore year. Johnson improved, however, and graduated in 1838—thirty-second of forty-five cadets. Commissioned a second lieutenant of infantry, Johnson’s prewar career consisted of service in both the Seminole and Mexican Wars. He participated in some of the more famous battles of the latter conflict, including the actions at Vera Cruz, Churubusco, and Chapultepec. By April 1851, Johnson was a captain serving on the western frontier. 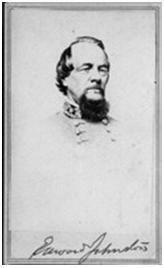 Though stationed at Governor’s Island, New York, in 1861, the strongly secessionist Johnson resigned his regular Army commission and was soon appointed colonel of the Twelfth Georgia Infantry. By November of the war’s first year, Johnson’s reputation for diligence and his ability to inspire his men earned him command of a brigade in the Army of the Northwest. On December 13, 1861, Johnson’s brigade, camped at Camp Allegheny, fended off repeated assaults by Federals under Robert H. Milroy. The victory earned Johnson a promotion to brigadier general and his nom de guerre, “Allegheny.” The following spring Johnson was severely wounded in the ankle leading his troops at the battle of McDowell. It would take the general a year to recover from the wound. When he returned to the service, much had changed in the Army of Northern Virginia due in large part to the death of “Stonewall” Jackson. In May 1863, Johnson, now a major general, assumed command of Jackson’s old division, leading it during Robert E. Lee’s invasion of Pennsylvania and the subsequent Battle of Gettysburg. In the late evening of July 2, Johnson’s division would spearhead the assault on Culp’s Hill, seizing the lower portion of the hill. The following morning reinforcements arrived and the attack was renewed, but it ultimately failed to drive off the well-entrenched Yankees. Later that year Johnson would play an important role in the Mine Run campaign. The last year of the war saw Johnson at the center of the some of its bloodiest fighting. On May 12, 1864, at the battle of Spotsylvania Court House, Johnson, along with his entire division, was captured in the savage hand-to-hand fighting at the Mule Shoe salient—a rare occurrence in Lee’s army. Held at Fort Delaware and later Morris Island, Old Allegheny was exchanged that summer and given command of a division in the Army of Tennessee. Present for the debacle at Spring Hill and the bloody assault at Franklin, Johnson was captured a second time after the December 16 battle of Nashville. This time, however, he would not be exchanged. The general was incarcerated at Johnson’s Island and, following the war’s conclusion, the Old Capitol Prison. When he was released July 1865, Johnson had the unique distinction of having been held in three of the war’s most infamous prisons. After the war Johnson returned to Chesterfield County as a farmer. He died in Richmond in 1873. Source of information: "The Civil War Trust," www.civilwar.org.